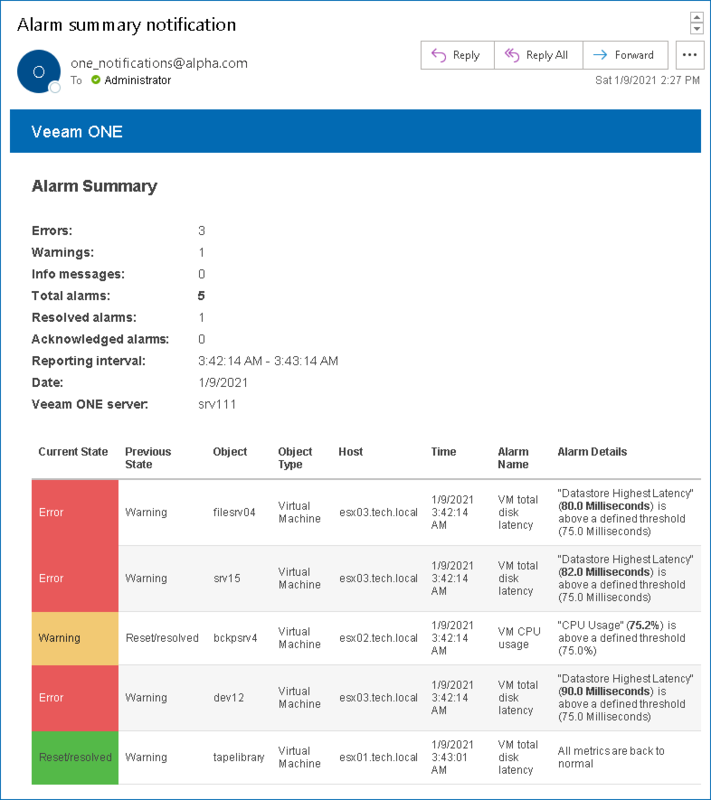 Veeam ONE sends an email notification when a new alarm is created or when the status of an existing alarm is changed. If you do not want to receive an email message each time a new alarm is triggered or alarm status changes, you can change the notification frequency. You can apply different types of notification policies to different infrastructure objects. Mission Critical notification policy is the default policy that is enabled for all infrastructure objects. This policy prescribes Veeam ONE to send an email notification every time a new alarm is created or the status of an existing alarm changes. An email notification contains details on the triggered alarm and affected object. The following image shows an example of an email notification for the Mission Critical policy. In the Server Settings window, open the Notification Policy tab. In the Email notification policies section, select Mission Critical and click Edit. 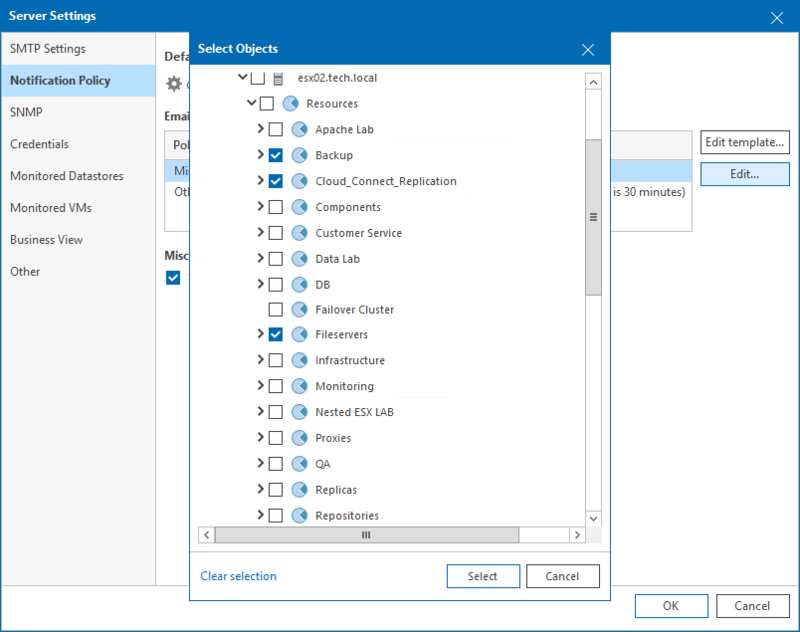 Infrastructure Tree — browse the virtual infrastructure hierarchy and select check boxes next to objects or infrastructure segments to which the policy settings must apply. Business View — browse the Veeam ONE Business View hierarchy and select check boxes next to groups or infrastructure objects to which the policy settings must apply. Data Protection View — browse the Veeam Backup & Replication infrastructure and select check boxes next to infrastructure components to which the policy settings must apply. vCloud Director View — browse the vCloud Director infrastructure and select check boxes next to infrastructure components to which the policy settings must apply. In the Select Objects window, click Select. 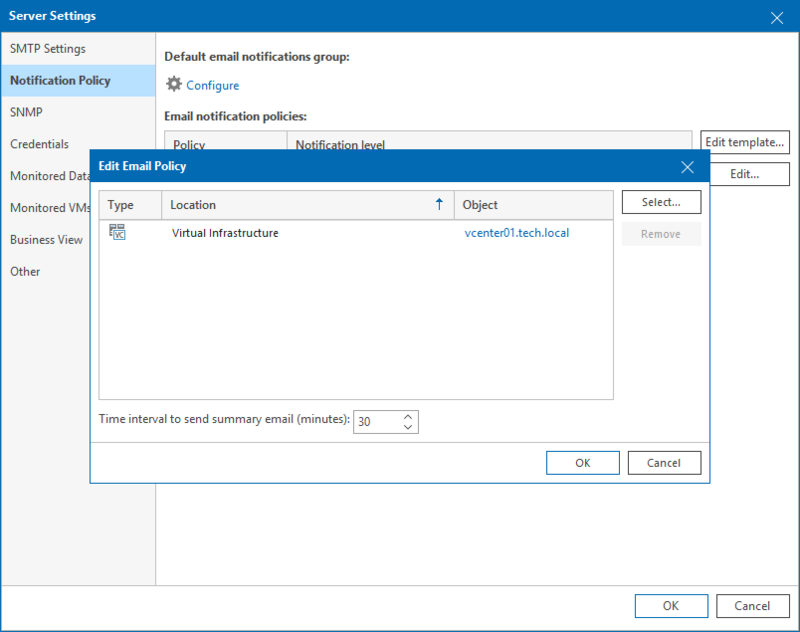 In the Edit Email Policy window, Click OK.
Other notification policy prescribes Veeam ONE to accumulate information about alarms and send an email notification once within a specific time interval (by default, a notification is sent once every 30 minutes). You do not receive a notification on every triggered alarm. Instead, Veeam ONE generates a message with a list of all alarms triggered over the past period. You can choose how often you want to receive summary email notifications. For example, if you specify the time interval of 15 minutes, you will receive notifications with the list of alarms triggered over the past 15 minutes. If no alarms are triggered over the past 15 minutes, you will not receive a summary email notification. The following image shows an example of a summary email notification for the Other policy. In the Email notification policies section, select the Mission Critical policy and click Edit. In the Edit Email Policy window, select the necessary type of infrastructure objects — Virtual Infrastructure, vCloud Infrastructure or Backup Infrastructure) and click Remove. In the Email notification policies section, select Other and click Edit. In the Time interval to send summary email (minutes) field, specify how often Veeam ONE must send out a summary email informing about triggered alarms. The default time interval is 30 minutes.